This isn\'t the first case of a major ally \'sinking\' a US carrier in exercises with a sub. It might be the first case with a nuclear sub though. How did such a tiny submarine kill a ship almost fifty times larger than itself? First of all, we don't know the rules of engagement of the exercise. Were the Roosevelt's escorts using all of their anti-submarine warfare sensors? Was there any prohibition or curb on their use, or were any of them declared inoperative for the purposes of the exercise? In March 2015, one of the largest nuclear-powered warships in the world was "sunk" by one of the smallest. On March 4th, 2015 the French Navy announced in a blog post that the submarine Saphir ("Sapphire") had simulated stalking and killing the carrier USS Theodore Roosevelt. Not only was the nuclear-powered aircraft carrier simulated sunk but an unknown number of her escorts. The post was later removed without comment from the blog. Here's what the world knows: according to the French navy blog post (saved and reproduced by the RP Defense blog), the exercise between Saphir and the USS Theodore Roosevelt Carrier Strike Group took place before an operational deployment. 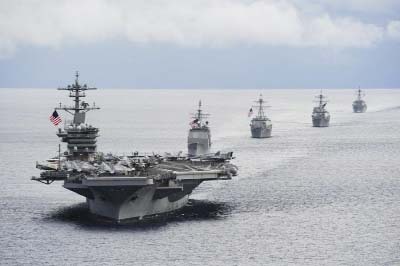 According to the French navy, the carrier strike group included several Ticonderoga-class guided missile cruisers and Arleigh Burke-class destroyers, and a Los Angeles-class nuclear attack submarine. The blog post explained that the pre-deployment exercise, which occurred off the coast of Florida, took place in two phases. The first phase involved the Saphir integrated with U.S. Navy forces to locate enemy submarines and pass data on to other friendly anti-submarine warfare assets. The "enemy submarine" in this case may have been the Los Angeles-class nuclear submarine attached to CSG 12. In the second phase of the exercise, the Saphir switched sides and became part of the enemy force. The French nuclear submarine was teamed up with U.S. Navy P-3C Orion and P-8 Poseidons. Saphir was to locate the Roosevelt and get into position to sink her. As the exercise scenario degenerated into a shooting war, Saphir was given permission to attack. The submarine reportedly "sank" Roosevelt and "most" of its escorts. After the exercise was over, Saphir's commander met with Rear Admiral Richard Butler, Commanding Officer of Carrier Strike Group 4 and Vice Admiral Nora Tyson, Deputy Commander, US Fleet Forces Command. The French Navy's blog post was announced on Twitter on March 4th, but was quickly deleted. Several defense outlets picked up on the deletion, and the state-sponsored RT (Russia Today) crowed that a "major vulnerability" had allowed Saphir to penetrate Roosevelt's screen. That was pure speculation, as the original French Navy post does not mention any such vulnerability.